is now recognised throughout Europe and in the USA as an effective treatment for most forms of hair loss, including male and female pattern baldness. It is suitable for anybody who is in the early stages of thinning. In the first consultation with a specialist, you should clearly explain what are your expectations of the laser hair loss therapy treatment and the Trichologist should tell you whether this is the right treatment for you and whether you can achieve the results you’d like. 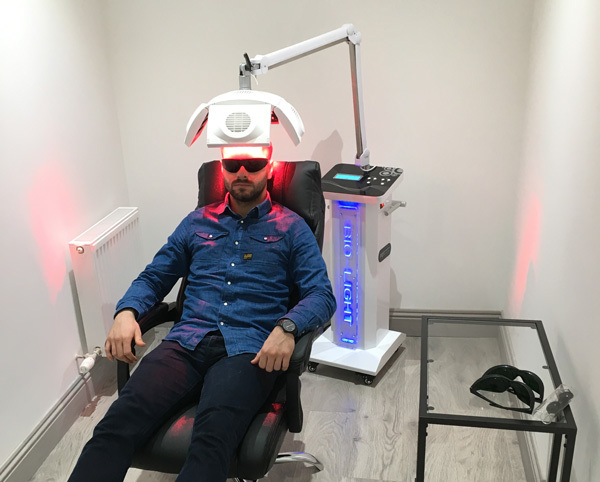 The best way to explain how Low-level laser light hair regrowth treatment works is as follows: the hair regrowth laser machine projects energy which in turn will massage the scalp and expand the pores of the skin. This means an increase of blood supply to the hair follicles, which will allow more nutrients to be absorbed. With these changes, the cell metabolism is also being stimulated which in turn it encourages tissue regeneration. Therefore, the existing hair can grow thicker and stronger and simultaneously a decline of hair loss you suffer is predicted. So, it is purported to encourage hair growth and improve the tensile strength of the hair fibre, possibly due to the therapy increasing microcirculation and also enhancing the hair papilla’s ability to produce cellular energy. Other physiological effects are: acceleration of tissue healing, pain reduction and decrease inflammation. During treatment, the laser therapy machine sits over the head. The laser hood is a static device which holds a number of diodes. The diodes omit a specific wavelength and frequency of light, delivering low level light therapy to the hair follicles. It conforms to European standards and American FDA (Food and Drug Administration) regulations for safety. It is painless, with no known side effects. Although shown to be effective in improving the thickness and fullness of hair on its own, the use of low level laser therapy is often combined with proven scalp and hair regrowth products for a full hair loss treatment program, so you will normally be given also some hair care and hair regrowth products for at-home use, in combination with the laser therapy, to try to achieve the best results possible. Repeated treatments are required weekly for approximately 6 months.